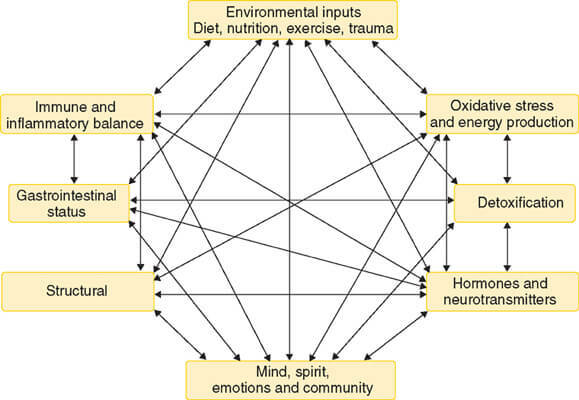 This diagram, from the Textbook of Functional Medicine, is an attempt to visually represent these interrelationships. Consider inflammation, a common example of a body not functioning properly. Inflammation underlies many chronic conditions including arthritis, heart disease, diabetes, high blood pressure, asthma, and inflammatory bowel disease. Looking at the diagram, we see inflammation could be caused by environmental inputs such as diet and exercise. And/or oxidative stress at the metabolic level. And/or imbalances in any of our hormone systems including thyroid, adrenals and pancreas. And/or psychological and emotional factors. And/or a structural issue. You have different genetics, You had different childhood experiences. You eat and exercise in an individual pattern. All these variables make us each unique. That’s the tricky part in dealing with health issues. What works for someone else may not work for you because of your unique combination of constitution and experiences. For conventional medical practitioners, this uniqueness is an inconvenient truth. I recall a doctor’s exasperation when it became clear that his go-to thyroid prescription wouldn’t help me. “But Synthroid works for 95% of people,” he sighed. Our uniqueness means that none of us is average. Yet many treatment decisions are made because “on average, drug X was effective.” An average is an arithmetic calculation and means that there were extremes at both ends of the pool of subjects—some who were greatly helped, and some not at all. So Synthroid is an effective thyroid replacement, but it was a disaster for me. A revealing article in ScienceNews discusses the shortcomings of statistics in medical research. Statistical tests are supposed to guide scientists in judging whether an experimental result reflects some real effect or is merely a random fluke, but…countless conclusions in the scientific literature are erroneous, and tests of medical dangers or treatments are often contradictory and confusing. … trial results are reported as averages that may obscure individual differences, masking beneficial or harm­ful effects and possibly leading to approval of drugs that are deadly for some, and [to] denial of effective treatment to others. 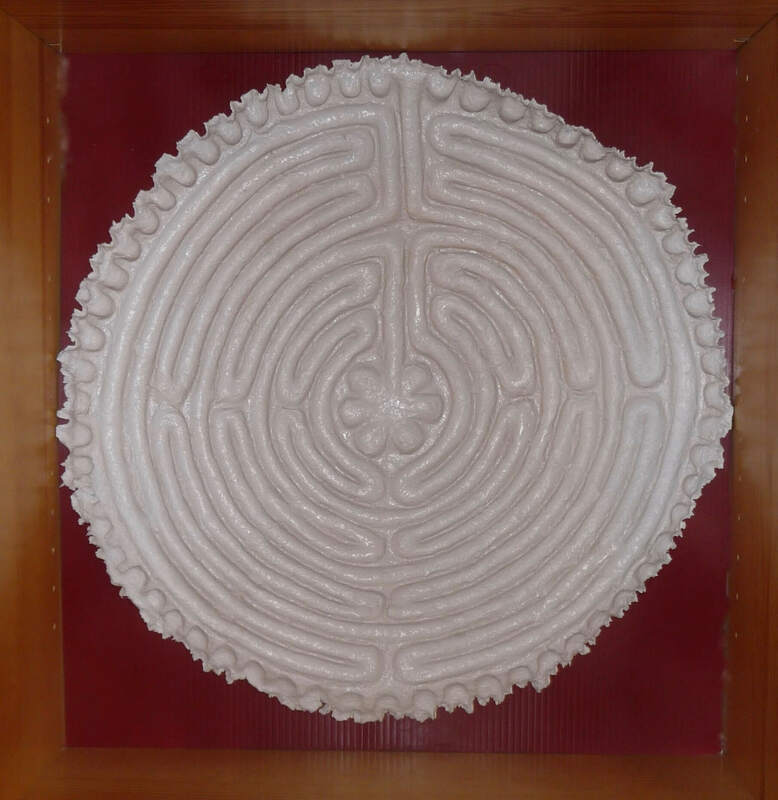 Life is a moving maze. I’d love to think that I can figure out a solution to a particular health issue and then it’s done and dusted. Settled. Un fait accompli. But it isn’t going to happen. Living systems are responsive and iterative—when something changes, they adapt in ways most likely to ensure survival of the system, When something else is changed, the system adapts again. It’s how we make progress. It also means that what works for us now may not work in a few months or years. That’s where I’m at with carbohydrate consumption. It took a low-carbohydrate diet to reverse the unhealthy condition of my body and drop 50 pounds. I ate non-starchy vegetables along with meat, fish, chicken, eggs and plenty of good fats like olive oil, coconut oil, and grass-fed butter. I had no grains of any kind, and no starchy vegetables such as corn, legumes, potatoes, yams, and other root vegetables. It was miraculous until it wasn’t. Over the course of a year, the inches melted away consistently, and I ended up back at my normal weight. Better yet, I experienced much less fatigue and my mind was clear again. I heaved a sigh of relief. 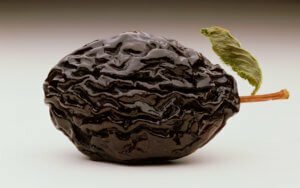 I started feeling like a prune. It showed in my skin, but I felt dried up on the inside too. It’s hard to describe, but I’ve had many years of developing body awareness, so I knew, I just knew. It did not feel like a fully healthy condition, even though my weight, blood pressure, and lab tests were now normal. This was puzzling. It was never mentioned as a side effect of low-carb, grain-free eating in anything I had read or heard so far. What now? As I do, I investigated. More about that in a later post. Organic systems respond best to personalized treatment plans. Like everything else in the reframing of our human experience, we are de-standardizing health. We are bringing medicine back into the realm of the “N of 1” or the “study of You.” You are not a randomized clinical trial. You are a specific symphony of information. Although I have found references to n-of-1 in the medical literature, acknowledgement of interconnection and individuality is still largely missing in conventional practice. Most often, illness is treated as an isolated disease or condition, and the “symphony of information” is ignored. In contrast, functional medicine starts from the premise that an individualized and evolving treatment plan is essential to truly resolve health issues. Fortunately for all of us, the functional approach is on the upsurge as more and more practitioners are drawn to thinking this way. You’ll find functional medical doctors, nutritionists, chiropractors, health coaches, acupuncturists, and Chinese Medicine doctors, among others. This entry was posted in Mindset, Viewpoints & Thinking for Ourselves, Making Decisions, All Posts—newest first and tagged functional medicine, living systems, systems theory, unique constitution, thyroid issue, low-carb diet, personalized medicine, integrative health, making treatment decisions by Laurana Rayne. Bookmark the permalink. I have recently been experimenting with acupuncture, cupping, naturopathy and supplement exploration. It has been interesting to pay such close attention to what my body is saying. It does indeed speak to me. Hi Susan. You’ve brought up some excellent points. There is a distinct difference between the desperation of a craving and the quiet knowing of a body that is telling you what it needs. In order to make that distinction, we have to be tuned in to our bodies. All the modalities you mentioned can help with that, and the reward is that we gain access to so much wisdom. Your closing comment inspired me to remember that simplicity is what I’m going for. Not in the simplistic sense of glossing over and ignoring information, but with the intention of discovering what is deeply satisfying…for my body as well as my mind. You’re most welcome. And thank you for the tips in response. Looking forward to your next post.